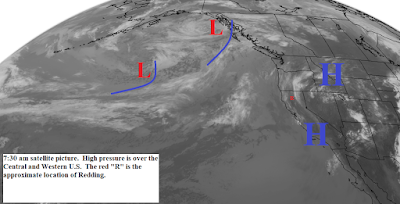 High pressure is now over the Central and Western U.S. Low pressure troughs and frontal systems approach the coast and then are diverted northeastward into the Pacific Northwest. Today through Friday we will see partly to mostly sunny skies with some afternoon clouds. There will be a chance of afternoon and evening thunderstorms over Siskiyou, Modoc, and northern Lassen counties. Temperatures will be near normal with light to moderate south to southwest winds in the afternoon. Saturday a stronger and colder low pressure trough will move through (see map below). This system will bring clouds and a few showers and thunderstorms from Redding northward. Temperatures will be 10 to 20 degrees below normal. Strong and gusty southwest to northwest winds are expected Saturday. Sunday the trough will be east of our area and high pressure will be building over the west coast. The high should hold through next week and during time we will see clear skies and warmer temperatures. The north valley should be back to the 100 degree mark by mid week.